For performing our financial hacking experiments (and for earning the financial fruits of our labor) we need some software machinery for research, testing, training, and live trading financial algorithms. No existing software platform today is really up to all those tasks. So you have no choice but to put together your system from different software packages. Fortunately, two are normally sufficient. I’ll use Zorro and R for most articles on this blog, but will also occasionally look into other tools. There’s not as much choice as it seems at first glance. You can avoid a programming language entirely by using a visual ‘strategy builder’, ‘code wizard’ or spreadsheet program for defining your strategy. Unfortunately this works for rather simple systems only, and I never heard of such a system that produced any consistent trading profit. For real development and research tasks, there’s no stepping around ‘real programming’. You’re also not totally free to select the programming language with the nicest or easiest syntax. One of the best compromises of simplicity and object orientation is probably Python. It also offers libraries with useful statistics and indicator functions. Consequently, many strategy developers start with programming their systems in Python… and soon run into serious limitations. There’s another criterion that is more relevant for system development than syntax: execution speed. Speed mostly depends on whether a computer language is compiled or interpreted. C, Pascal, or Java are compiled languages, meaning that the code runs directly on the processor (C, C++, Pascal) or on a ‘virtual machine’ (Java). Python, R, or Matlab is interpreted: The code won’t run by itself, but is executed by an interpreter software. Interpreted languages are much slower and need more CPU and memory resources than compiled languages. But they have the advantage of being interactive: you can enter commands directly at a console. Some languages, such as C#, are inbetween: They are compiled to a machine-independent interim code that is then, dependent on implementation, either interpreted or converted to machine code. C# is about 4 times slower than C, but still 30 times faster than Python. Speed becomes important as soon as you want to develop a short-term trading system. In the development process you’re all the time testing system variants. A 10-years backtest with M1 historical data executes the strategy about 3 million times. If a C-written strategy needs 1 minute for this, the same strategy in EasyLanguage would need about 30 minutes, in Python 2 hours, and in R more than 10 hours! And that’s only a backtest, no optimization or WFO run. If I had coded the trend experiment in Python or R, I would today still wait for the results. You can see why trade platforms normally use a C variant or a proprietary compiled language for their strategies. HFT systems are anyway written in C or directly in machine language. However, the differences are not as bad as suggested by the benchmark table. There’s a trick for overcoming slow language speed. Even interpreted languages have function libraries that are often written in C/C++. A script that does not have to go step by step through historical data, but only calls library functions that process all data simultaneously, would run with comparable speed in all languages. Indeed some trading systems can be coded in this vector-based method (you’ll see an example below in R code). Unfortunately this works only with simple systems, and only for backtests. It can not be used for strategies that really trade. It’s free (unless you’re rich). Scripts are in C, event driven and very fast. You can code a system or an idea in 5 minutes. Open architecture – you can add anything with DLL plugins. Minimalistic – just a frontend to a programming language. Can be automatized for experiments. Very stable – I rarely found bugs and they were fixed fast. Very accurate, realistic trading simulation, including HFT. Supports also options and futures, and portfolios of multiple assets. Has a library with 100s of indicators, statistics and machine learning functions, most with source code. Is continuously developed and supported (new versions usually come out every 2..3 months). You can see that Zorro offers a relatively easy trading implementation. But here comes the drawback of the C language: You can not as easy drop in external libraries as in Python or R. Using a C/C++ based data analysis or machine learning package involves sometimes a lengthy implementation. Fortunately, Zorro can also call R functions for those purposes. R scripts can be very short and effective (once you got used to the syntax). It’s the global standard for data analysis and machine learning. Open architecture – you can add modules for almost anything. 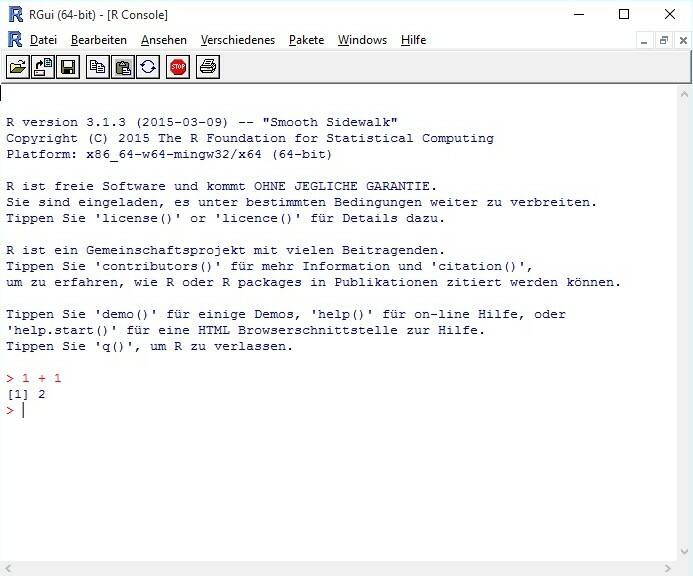 Minimalistic – just a console with a language interpreter. Very stable – I found a few bugs in external libraries, but so far never in the main program. Has tons of “packages” for all imaginable mathematical and statistical tasks, and especially for machine learning. Is continuously developed and supported by the global scientific community (about 15 new packages usually come out every day). You can see that the vector-based code just consists of function calls. It runs almost as fast as the C equivalent. But it is difficult to read, it can not be used for real trading, and details such as a stop loss had to be omitted since they would not work for a vector-based test. Thus, so good R is for interactive data analysis, so hopeless is it for writing trade strategies – although some R packages (for instance, quantstrat) even offer rudimentary optimization and test functions. They all require an awkward coding style and do not simulate trading very realistically, but are still too slow for serious backtests. Although R can not replace a serious backtest and trading platform, Zorro and R complement each other perfectly: Here is an example of a machine learning system build together with a deep learning package from R and the training and trading framework from Zorro. Aside from languages and platforms, you’ll often need auxiliary tools that may be small, simple, cheap, but all the more important since you’re using them all the time. 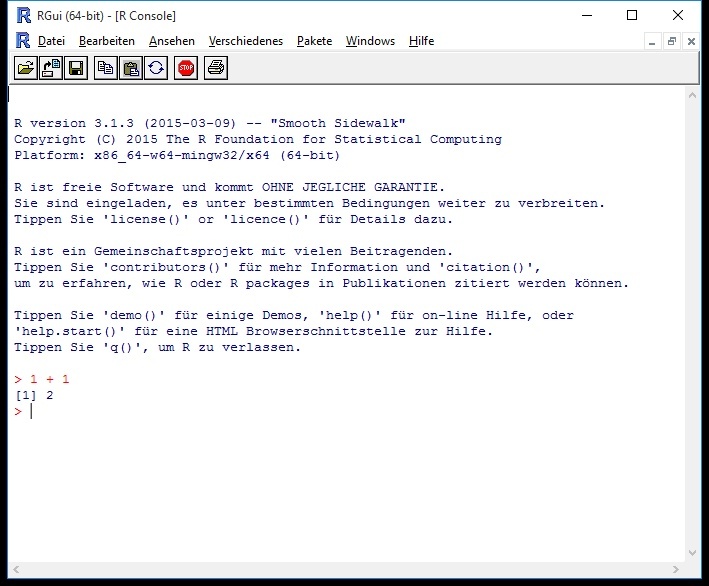 For editing scripts I don’t use Zorro’s SED editor or the R console, but Notepad++ (meanwhile supported by Zorro’s help system). For interactive working with R I recommend RStudio. 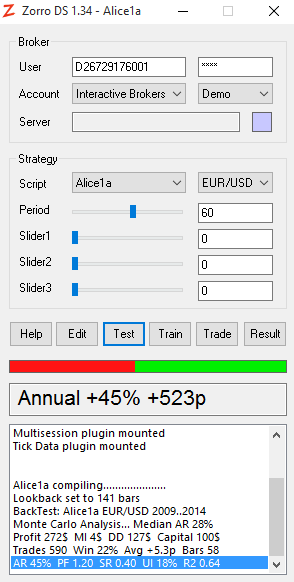 Very helpful for strategy development is a file comparison tool: You often have to compare trade logs of different system variants and check which variant opened which trade a little earlier or later, and which consequences that had. For this I use Beyond Compare. Aside from Zorro and R, there’s also a relatively new system development software that I plan to examine closer at some time in the future, TSSB for generating and testing bias-free trading systems with advanced machine learning algorithms. David Aronson and Timothy Masters were involved in its development, so it certainly won’t be as useless as most other “trade system generating” software. However, there’s again a limitation: TSSB can not trade or export, so you can not really use the ingenious systems that you developed with it. Maybe I’ll find a solution to combine TSSB with Zorro. Update (November 2017). The release of new deep learning packages has made TSSB sort of obsolete. For instance, the H2O package natively supports several ways of features filtering and dimensionality reduction, as well as ensembles, both so far the strength of TSSB. H2O can be used with Zorro’s advise function. Still, the TSSB book by Davin Aronson is a valuable source of methods, approaches, and tips about machine learning for financial prediction. Download links to the latest versions of Zorro and R are placed on the side bar. A brief tutorial to both Zorro an R is contained in the Zorro manual; a more comprehensive introduction into working with Zorro can be found in the Black Book. It is always interesting to read about your exploits. It seems, you have a real passion for the sience of algo trading and it’s contagious 🙂 Keep going! From the picture of your Zorro interface above, one can tell that it’s connected to IB. How did you do it? 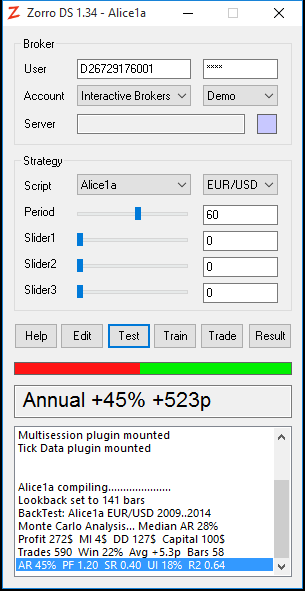 Yes, the IB plugin is in development and I have already a test version. It currently works for Forex, but not yet for stocks. Have you again looked at TSSB? I am biting my teeth out on it, but somehow not making enough progress. Not yet, but it’s on my todo list. Unfortunately the list is quite long at the moment, so it might take a while. Well, Zorro is not exactly free. It’s free unless you have more than 7000 US$ in your account. All running on JVM, and with the Java 1.9 (next release) I plan to use the Java REPL. Luckily now, there’s more room to use the software tools with which you are most comfortable. For example, on Python you can run on PyPy or Cython (which speeds scripts up to C/C++ levels). There is also a wide array of packages for statistical analysis, financial modelling and artificial intelligence usage. All this comes in handy when you can leverage on your proficiency to write fine trading systems quickly with what you. Which beats learning a new language altogether! Don’t get me wrong, I like your blog and your articles are very interesting, however, I must say I don’t share the same enthusiasm for Zorro platform. I download it and tried it as well as its website. It’s all weird. It seems pretty fast but buggy. If you want to trade seriously you have to buy some license ( no problem ) but according to my targets working with IB, it doesn’t apply. I don’t know, I don’t trust it to put any logic in there. Just out of interest: “my targets working with IB, it doesn’t apply” – what targets do you mean and what does not apply? Besides IB, what other stock and futures brokers can Zorro be used with? You can find a list in the Zorro manual. Next Next post: Is “Scalping” Irrational?